Crap! Crap! Crap! Crap! Crap! Okay laugh at my pain and don't make my stupid mistake. You know how when you remove a movie disc from a case you depress the center? 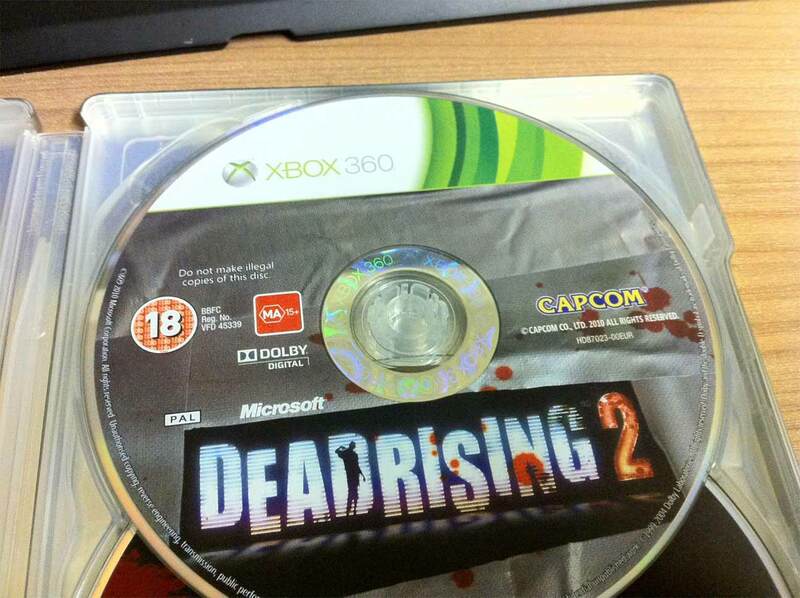 Seems a normal way to remove a disc from the case. Press the center and remove the disc in one action. I forgot something in the older PS2 Sony memory card holder cases. The center has to be depressed and released BEFORE removing the disc. The center holder has to pop the disc out all the way off. If the disc doesn't pop off, the center has large tabs that will really grab the disc when removing. In my stupidity I removed the disc like a DVD movie, pressing down the center and pulling the disc at the same time. DVD case and my big paws tug-of-war won and the disc lost. Really didn't take much for that heartbreaking loud crack. A search found three Gamestops where I can re-purchase the game. I don't have to drive around to get a CIB. The manual, and cover are pristine. The disc is not quite new condition anymore. Maybe need a new case too, I did vent and cut the center tab off in little tiny pieces. Man this design is worse then the ECO cases. Okay has anyone else done something this foolish? Last edited by CRTGAMER on Tue Sep 27, 2011 7:27 pm, edited 3 times in total. If you aren't having a good time, why are you playing? CRTGAMER wrote: Crap! Crap! Crap! Crap! Crap! Wow, that's awful! This has not happened to me yet, but I'm really worried that it will. I really appreciate this post, though, because I honestly didn't really understand how the PS2 cases worked. I'll be very careful in the future! I'm sorry it happened to you, but I learned something from it. I actually like those cases. It's the ones where the button in the middle is a tad too big, and doesn't have any sort of mechanism to release the disk. You just have to be real careful and hope you don't break the disk . You know what I hate? Those cases that have no mechanism at all and you have to bend the disc quite a lot just to get it out! I mean, discs are really resistant but damn, it hurts me every time! Lately I don't take them that way, I push the tabs toward the center so as to not damage the disc. Glad to get the word out, I hope this doesn't happen to anyone else. If it did, raise your hand so I won't feel so stupid. The game that cracked is Katamari Damacy, an easy replacement. Game was already installed with HDAdvance, so no reason to remove the disc from the case. I had it on the table next to me while writing a review. Now here is the real irony, okay stop snickering! Flake wrote a recent post about a damaged game disc from shipping. This got my curiosity if the shiny data side is all the way to the hub. I just had to pull the nearest disc and look. Not blaming you Flake, my stupidity, but also glad to discover this. Press and Release the center, BEFORE removing the disc. In a way its good this happened now, since used PS2 games are plentiful and cheap. Maybe I should mount that cracked disc visible at my shelf. A cruel reminder whenever I retrieve a game to install. I am so tempted to go thru all my cases and dremel off the tabs. I do like the memory card holders. Although not used except the one with the Action Replay update. This happened to me once with my copy of the Complete Truth About DeEvolution DVD. Something didn't go right getting out and the exact same thing happened with my disc I then bought a new copy because it's such a great DVD. Though it could be better. Okay got a replacement Katamari game disc. First Gamestop had a CIB but the disc had a large flake of paint missing! Probably same thing happened, disc warped upon removal, flaking that paint. Second Gamestop had one slightly scratched so took it home and installed on my spare PS2. Primary PS2 still has the installed new one before getting damaged. Turns out multiple errors at 93% install and wouldn't go further. So back to a third Gamestop and finally found a pristine copy. Finally got a good Install. Man I love HDAvance. Not only for the hard drive convenience but also a great way for verifying ever bit and sector of used purchases! From now on I'm pushing the center , even when replacing a disc back in a PS2 case. PS3 cases are similar, though not as bad. Those little holders always concern me, but I've never had an issue with the PS2 ones. It's the Gamecube ones that make me hold my breath. These need to die. I hate them. You can't press the centre down to release the disc you just have to pull and pray the damn thing doesn't break. It makes me cringe when I see the disc bending.